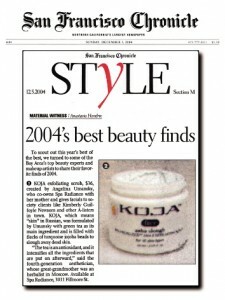 "To scout out this year's best of the best, we turned to some of the Bay Area's top beauty experts and makeup artists to share their favorite finds of 2004. KOJA exfoliating scrub, created by Angelina Umansky, who co-owns Spa Radiance with her mother and gives facials to society clients like Kimberly Guilfoyle Newsom and other A-listers in town. KOJA, which means "skin" in Russian, was formulated by Umansky with green tea as its main ingredient and is filled with flecks of turqoise jojoba beads to slough away dead skin. The tea is an antioxidant, and it intensifies all the ingredients that are put on afterward," said the fourth-generation aesthetician, whose great-grandmother was an herbalist in Moscow."